Earlier today, along with my team, fought through the early morning rush hour to get to Sheraton PJ, a new hotel across from the Asia Jaya LRT station. 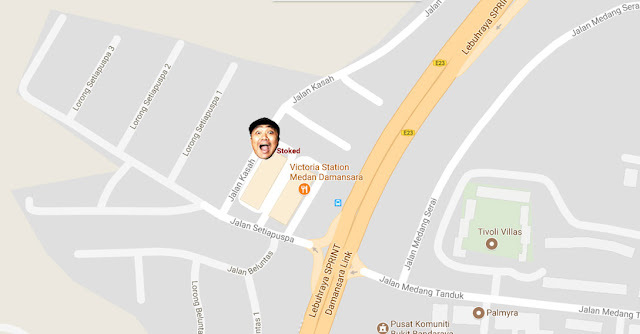 Should have just taken the train over from Kelana Jaya instead of driving but then, it was early in the day and my body was moving on auto-pilot while my brain is still in sleep mode. The occasion was the launch of UYA Asia, Asia's first ever Entertainment Market Hub, an emerging player in the e-commerce industry led by a team of individuals who are experts in the marketing industry. UYA Asia officially open their 'doors' for business today, creating a unified online business hub via www.uyaasia.com. 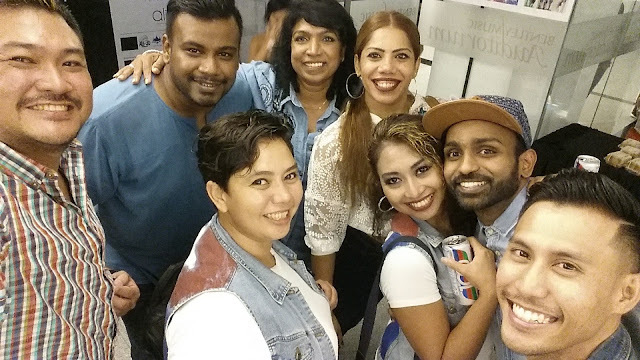 UYA Asia did not hold back when they say they want to launch the online hub with a bang, with 300+ guests in attendance, they wowed the crowd with interesting dance performances & a series of booths featuring some of the major brands they are working closely with. “UYA Asia offers more than just an online shopping experience,” says Philip Chow, the Founder & CEO of UYA Asia. “We are dubbed as Asia’s first Entertainment Market Hub because our online platform also offers a range of entertainment for free including short movie clips, games, mingling with ambassadors and even an area for our customers to win attractive prizes!” Philip adds. While UYA strives to provide a platform that caters to people from all walks of life, the team behind this online platform ensures that businesses that would want to take up a space on their site will need to go through a stringent quality check before going live. “At UYA Asia, we are extremely diligent in ensuring that the merchants that sign up at our site are of quality. This will ensure that both the customers and business owners can enjoy a seamless online shopping experience at UYA Asia,” says Philip. In addition, customers can read or watch reviews of the products they intend to purchase at UYA Asia. A pool of influencers and bloggers will be engaged to do reviews so that customers can make informed decisions before purchasing any product or services through UYA Asia. 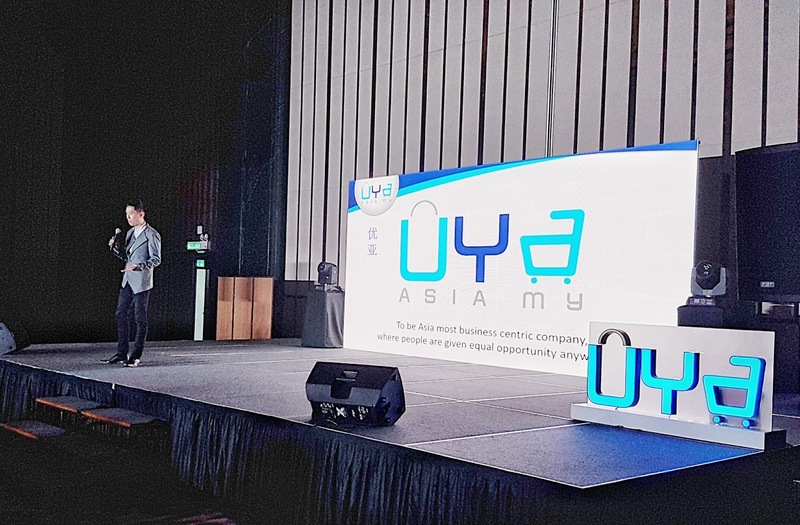 During the launch, Philip highlights that UYA Asia is placing customer service as the pinnacle of its service. While other major players in the market offers personalised customer service to large account holders, UYA Asia has recruited a large team to service every single business account holder with UYA Asia. I've yet to put my faith in the local online market space, a lot of the sites are still not 100% secure and read enough horror stories of actual products not appearing as seen on the sites, so let's see if www.uyaasia.com can change that. Post event, on December 8, 2017. UYA Asia's CEO, Mr. Philip Chow was interviewed by Capital TV to talk more about why he came up with UYA Asia. To jump straight to the Facebook Album, click here. Definitely a great weekend of dancing, taking me a few days to recover from it. There's more festivals around the corner and as we wave goodbye to 2017, we can now look at the calendar for 2018 to plan our festival get-away. A friend decide that we should have a nice dinner to celebrate my birthday and I decided on a nice romantic place for it. Well, that was the hope. When we got there, there was 2 big groups celebrating birthdays at the same time and it got pretty noisy after awhile. 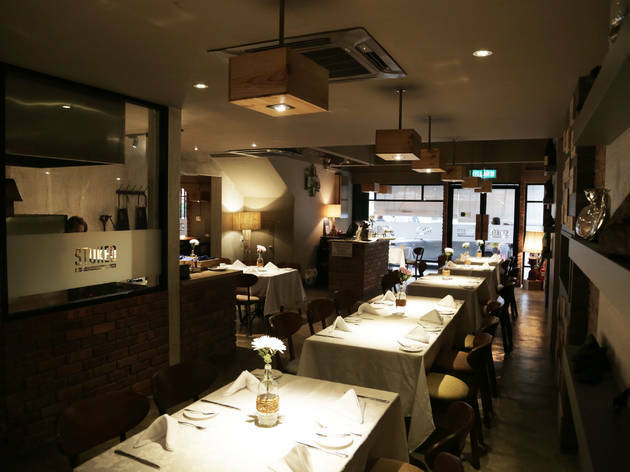 But the restaurant itself is nice and cozy and we believe that it would have been a nice quiet dinner if not for the celebrations. The menu was simple, which is great as we don't have to flip through pages just to decide on what to eat. So choosing what we want for dinner was easy. To start off the dinner, we ordered the Truffle, King Mushroom, Maitake, Mushroom Broth, a clear broth with a strong earthy scent. The mushrooms are fresh and crunchy to the bite but as a person that's not into mushroom, it didn't appeal to me. But a restaurant doesn't produce food to cater to a single person's taste bud, right? 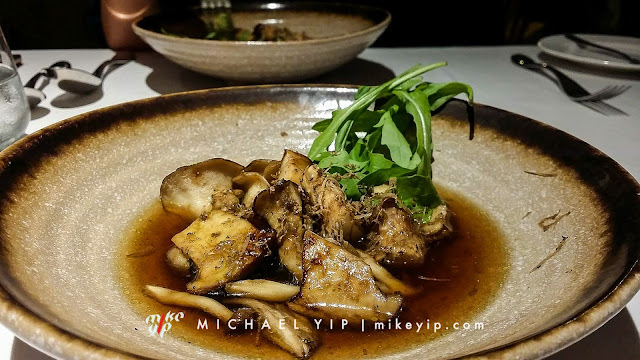 If you're a fan of mushroom, definitely give it a try. 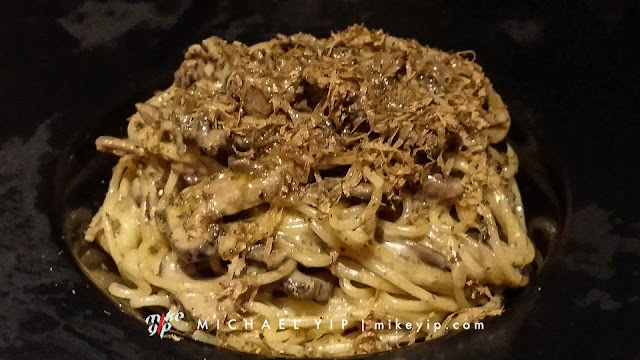 My friend ordered the Wild Mushroom Pasta with fresh autumn truffle. The cream isn't too heavy and the pasta is just at the perfect texture. Portion wise, if you are a small eater, and you ordered the dish as a main course, then share as there was plenty to go around. We shared this plate of pasta and couldn't finish, but then, maybe because I also had another dish for dinner. Yup, this is what I ordered, 450g of Spanish Iberico Pork Ribs. The 450g made it look like a huge thing but it isn't. Beautifully roasted but the flesh take a bit of effort to be removed from the bones though. Maybe because I've been eating ribs that just melts in your mouth that I forgot how much of a fight it takes to do this. The glaze on the meat itself is beautifully caramelized and doesn't need any additional sauces or dips to go with the meat. 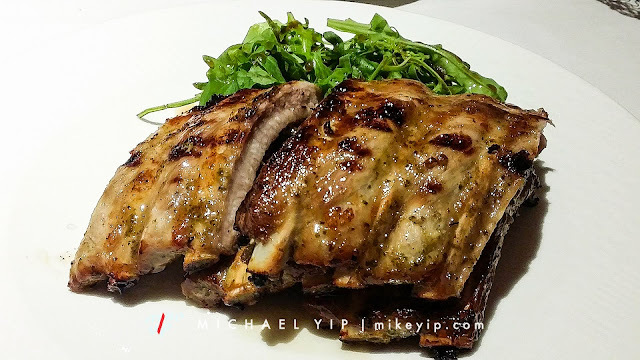 Personally, wish the pork ribs to be bigger but then, I'm a huge pork person and a small rib like this is never enough. Before the starters arrive though, we had these House Baked Breads, smokey and crunchy. 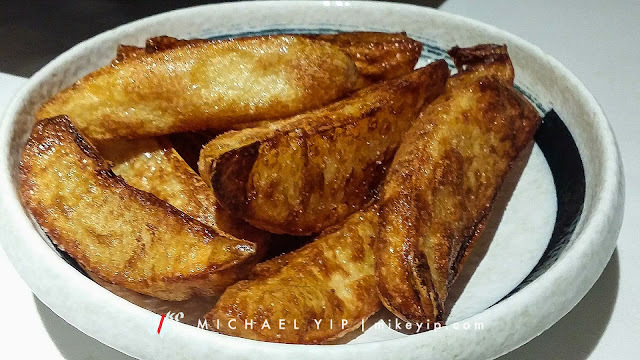 And these caramelized potato chips. Pretty addictive stuff simply because it is at the right sweetness and the inside was soft to the bite. Will definitely visit the place again for another meal at a more quieter time. At least to enjoy the night because this trip, by the time we were done with our meal and planned to sit around and chat over a bottle of wine was spoiled by the noise of the party. Yes, for a man who spend a lot of his time in loud music environment, there are more days than not that I prefer a quiet time to unwind and have a nice conversation. Especially in a cozy environment like Stoke. 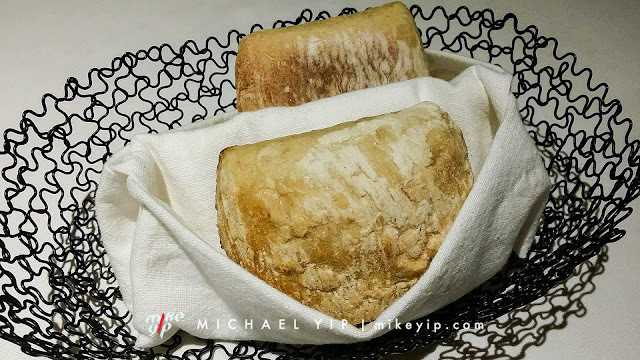 Price wise, it is a tad on the pricey side but I don't state the price of the meals I eat as I always believe that if you want to eat, be certain that you can afford to pay for it. It's the row behind Victoria Station / El Sid's ... Below Vintry. Note: Since a lot of friends asked whether I get sponsored food for reviews. Meals was not sponsored, we pay for our own meal so that I write the review based on what I feel and not hampered by the restaurant's need to have the review done in a positive manner. Photos taken on this page was shot using my old smartphone.